As I mention in the beginning, drinking Anchor Steam in San Francisco was one of the things that helped get me into beer. Ever since, their beers have a special place in my heart, even their smell is distinctive and takes me back to the city by the bay. Anchor steam, liberty ale, and their porter are available in a few spots in NI already, but its good to see a few more of their brews available locally. Neither of these are part of my quest to drink my way through "1001 Beers" but are still worth trying and reviewing! Style: Brown Ale. ABV: 6%. From: Lighthouse Wines. Description: A mid brown cola sort of colour, with a tan head. 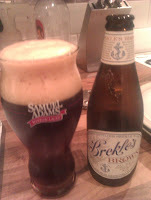 Decent hop aroma, but then toasted malt and some chocolate/coffee, and a hint of nuts. Good malt profile, but then the hops come through with a little citrus. Some nuttiness in flavour too. Light to Mid bodied. Thoughts: I love a brown ale, especially at this time of the year, and this was really good. A nice hoppiness to balance out the malt made this drinkable. Will happily buy this again. 113. Anchor Big Leaf Maple. Description: Poured a red/deep amber colour, clear, with a big tan head. Straight up aroma of anchor beer, presumably from the yeast. Behind that there a little maltyness and then the maple comes through. 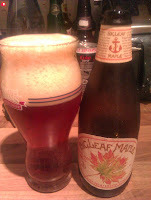 Flavour of a earthy red ale, with a hint of maple and sweetness on the finish. Light bodied with a dry finish. Thoughts: Another good beer from Anchor, while I'm not sure I would have got the maple as much if I hadn't been looking for it, it is in there! This beer is pure autumnal and pure anchor. Love the label too. t's that time of the year again, Belfast Beer Fest is back from 21st-23rd November - I'll be there on the Friday sampling whatever I can get my hands on. It's always a fun day out, so if your about that weekend I'd recommend making your way to the King's Hall.